This report presents a brief review of background literature, shares key findings from focus-group interviews conducted with three ethno-linguistic communities, and discusses conclusions and recommendations for ethnic-based and aging service organizations, researchers and policy makers. In order to support the growing population of foreign-born older adults who will age in the United States, we need to understand how “healthy” or “successful” aging is perceived, barriers to aging well, and the nature of intergenerational relations, particularly as they relate to care for elders. 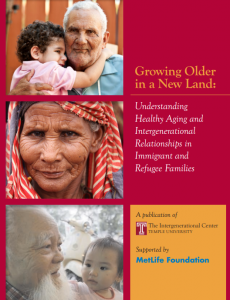 Through this exploratory study funded by MetLife Foundation, we listened to the voices of Vietnamese, Somali and Mexican immigrants and refugees who provided important insights into the meaning of healthy aging and the changing patterns of intergenerational exchange. This report presents a brief review of background literature, shares key findings from focus-group interviews conducted with three ethno-linguistic communities, and discusses conclusions and recommendations for ethnic-based and aging service organizations, researchers and policy makers.